Clean, polish, and protect your paint in one easy to apply wax! Meguiar's Black Wax will clean, polish, and protect all in one step! Black Wax contains a mild blend of micro cleaners that help clean, and polish away light contamination and swirls with ease. This helps create an amazing finish quickly and easy on any color paint, although it really shines on darker colored paintwork. We recommend applying this wax by hand, however it can be applied with a buffer as well. With an applicator pad simply apply to the paint nice and thin with light to medium pressure. If you are going to use a buffer apply at a low speed with a soft pad (ie blue pad). Once applied you will be left with a durable layer of protection that will last 3-4 weeks and have your paintwork looking it's best. 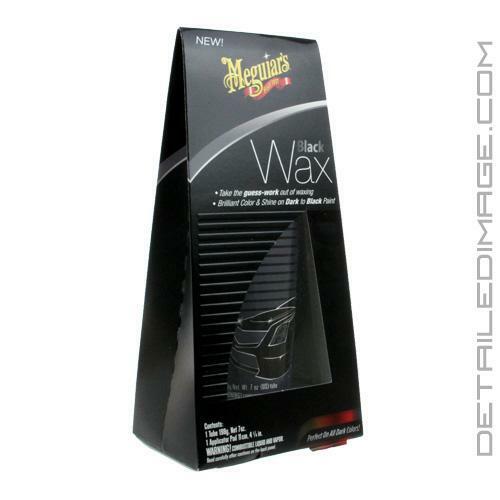 Clean, polish, and protect all in one step with the Meguiar's Black Wax! DARK to BLACK colored car? This is your wax! No guessing. Meguiar's makes it easy! Clear coat safe; no dyes or colorants! DIRECTIONS:For glossy paint finishes only (NOT for use on flat, matte or satin finishes). For best results, apply to a freshly washed & dried surface that is cool and in the shade. May be applied by hand, dual action (DA) polisher or Meguiar's DA Power System. Apply a small amount of product to the included foam applicator pad (HAND), or directly to either a polishing or waxing foam pad (DA). Using moderate pressure, work the product into the paint making 2 to 4 overlapping passes. If applying by HAND, use a tight, circular pattern. Dull, neglected paint may benefit from more passes. Work one section at a time until the vehicle has been completed. Allow the product to dry to a haze, then use a premium towel like Meguiar's Supreme Shine microfiber or 100% cotton terry towel to remove the product. Turn to a clean portion of the towel for final wipe off, buffing to a brilliantly bright shine that lasts! Used this on a dark gray 300C. Car looks good. Fairly easy to apply with a Porter Cable buffer. Easy to remove with a MF towel. Can't comment at this point on longevity. When used by hand this Wax doesn't do much. When applied with a DA on a yellow polishing pad it shines. Removes lights scratches and "murkiness" in the paint. This wax doesn't last long though. Maybe three weeks. I top it with a synthetic spray wax to add longevity and as a final wipe to make sure I didn't miss any spots. I would highly recommend this wax as a good cleaner wax.